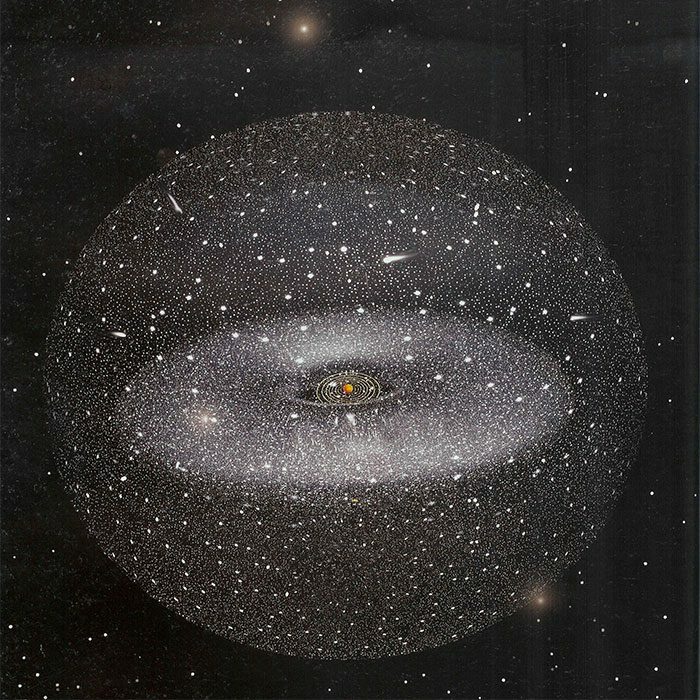 The Oort cloud, also known as the Öpik–Oort cloud, is a spherical cloud of icy objects that is believed to surround the Sun at around 50,000 Astronomical Units (AU). This extended shell is named after Dutch astronomer Jan Oort and Estonian astronomer Ernst Öpik who theorized its existence. The Kuiper Belt and the scattered disc are less than one thousandth as far from the Sun as the Oort cloud is. It is believed that this cloud of particles are the remains of the disc material which formed the Sun and the eight planets. Astronomers have theorized that the matter composing the Oort cloud formed close to the Sun but was scattered out into space by the powerful gravity of the gas giant planets early in the solar system’s evolution. The outer Oort cloud is only loosely bound to the solar system – this means that it is easily effected by gravitational pull from passing stars and the Milky Way galaxy. In fact, the outer limit of the Oort cloud defines the cosmographical boundary of the solar system on the edges of the Sun’s gravitational dominance. It is believed that the Oort Cloud occupies an enormous space starting between 2,000-5,000 AU from the Sun and stretching out to as far as 50,000 AU – around 7.5 trillion kilometres. This is about a quarter of the distance to the nearest star, Proxima Centauri. Objects found in the Oort Cloud are known as trans-Neptunian objects. This applies to all objects beyond the orbit of Neptune and includes the Kuiper Belt objects as well. One theory is that the Sun captured Oort Cloud cometary material from outer discs of other stars which were forming in the same nebula as the Sun. The Oort cloud comprises two regions. There is a spherical outer Oort cloud, and a disc shaped inner cloud called the Hills cloud. Objects in the Oort Cloud are mostly composed of water ice, ammonia and methane. The estimated number of objects believed to be in the Oort Cloud is around 2 trillion – although there is currently no way to verify this theory. Long-period comets (with orbit paths of over 200 years) are believed to originate from the Oort Cloud, according to many astronomers. The planetoid Sedna, also known as 90377, was discovered in 2003 and thought to be from the inner Oort Cloud. As of 2012, this planetoid was about three times the distance of Neptune from the Sun.